I just wanted to tell you that spending time at RIO Hair Studio is a luxury that I treasure. Not only do you make my hair look absolutely fabulous, but also you give me helpful, informative advice on the best styling techniques and products to use that keep my hair healthy. My crazy hair is wiry, oftentimes frizzy and coarse, but you’ve taught me how to make it soft, manageable and shiny. I love the color gloss you use…so gorgeous! Also, I feel like I can go to any of the awesome stylists. Everyone makes me feel like a VIP when I’m there. As soon as I get there, there’s a Diet Coke or a glass of wine…depending on my mood! Thank you so much for giving me a haven from the hectic work day. When I leave RIO Hair Studio, I feel special and beautiful…a winning combination for my confidence! I’ve been a RIO Hair Studio client for the last few months on a regular basis. Everyone who works there is very friendly and immediately they make the customers feel relaxed. My hair stylist is just FABULOUS! She listens to what her clients want, and she is very knowledgeable about the Redken line. Her haircuts and blowouts are amazing and they will last for days. I could not imagine going to anyone else! New to Jacksonville eight years ago, I had tried a few salons for color and ended up for about a year with a stylist who I thought was doing a great job – until my hair started falling out because of extreme over-processing. RIO Hair Studio and owner Misty Burbridge were referred to me by a new friend I had met at the beach. I have been a client ever since, and my hair is very happy for this. 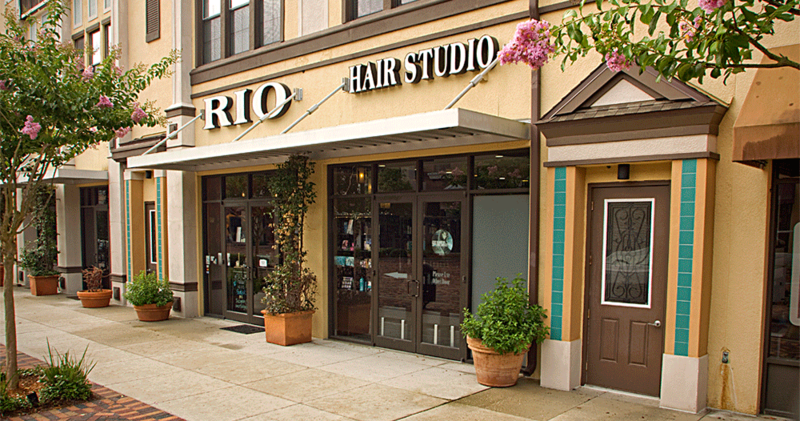 RIO Hair Studio has a casual yet very professional environment. I leave there feeling beautiful inside and out. The staff is so gracious and friendly that you immediately feel comfortable – so comfortable, in fact, that I have had other hairdressers at RIO Hair Studio color my hair if Misty is unavailable and it is perfect every time. All the stylists work hard to stay current with hair and colors and cuts and they have three Certified Redken Colorists, which is like being a doctor in hair color, and I am proud to say Misty is one of them. I love RIO Hair Studio and always look forward to my next appointment!